The chime sounded on my phone a couple of days ago. As I checked it, I discovered a text from one of Daniel’s teachers. No message, just a photo. 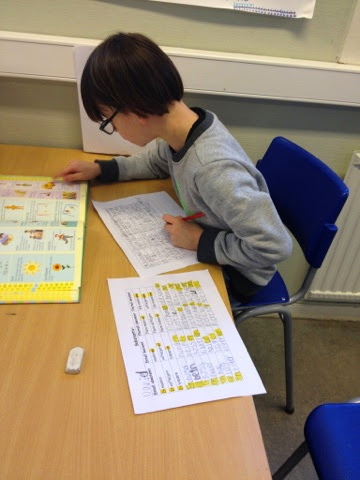 How happy it made me to see him working so diligently during Norwegian class! For those who have recently asked, our boys attend an International Baccalaureate School. The majority of the teaching is in English, but they have about 5 hours of Norwegian class each week. Previous PostSurgery Next WeekNext PostI survived surgery in another country! I didn't realize it was an IB school they went to…both the elementary and high school that we are zoned for (Peachtree and Norcross) have IB programs.